Its a tough task to bring up a hyper active child, because of their ever changing mood and activities. It sometimes becomes difficult to keep an eye on the activities of such children. Many times it is frustrating for the parents. There several ways in alternative medicines which will help the child as well as parents stay calm.Below are few suggestions, to help your child calm down and help you control your frustration. 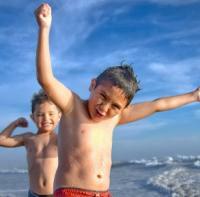 Physical Exercise: It is very important to make your child do some physical exercise daily. Remember, if it is possible let them do exercise outdoor and not in artificial lighting and environment.Study reveals that, kids staying most of their time inside with artificial light are more restless. Make sure their room get adequate sun light and free air. This will help them to calm down easily. Keep a practice of doing yoga regularly. Believe me this will help you in leading a healthy life and your kid will get inspiration of this to make yoga as a routine.Make whole family follow some yogic exercises. Color Effect: Dark color like Red are known to increase stress and blood pressure. Reduce or remove dark colors from your kids’ room. Paint walls with light colors like light blue or baby pink. Keep few smiling, playful images on the wall. Train them to use natural light as much as possible.All these will help to reduce stress on your child and in turn, help them to remain calm. Body Massage: For all age body massage is the best solution for restlessness and children are no exception. Massage your child with a proper oil. You can add little aromatic oil, like lavender. It will help your child calm down quickly. Again, it will help in building a bond between you and your kid reducing your frustration on his/her activities. Deep Breathing: Deep breathing is a well-known solution to reduce stress immediately. Teach your child to have deep breathing when ever he/she feels restless. You should demonstrate to inspire your child regularly to do so. Food Selection: Remember, food has everlasting effects of the body as well as the mind. Try to avoid all kind of spicy, oily and fried food. Any drinks with caffeine will increase restlessness in your kid. Avoid those! Fast food is an enemy in case of restlessness, aggression and stress. You should avoid as much as possible. Reduce sugar in food items. The less, the better. Lots of water helps in the cleansing of body and there by the mind. Regular intake of fresh vegetables and fresh fruit will help in calming down. Fish can be taken, but avoid meat and shellfish. Medication to make your child calm down may have immediate affect, but remember, any kind of medication can have side effects and hence should be avoided in case of children, when ever possible. Don’t run to a doctor saying “my child is restless stealing my day and night” and introduce his/her tender mind and body to a word of harmful medicines. Prescribing medicine without a physical check up is not advisable.Please visit a near by ayurvedic doctor and give medicines as per suggestion from him. Along with that you might follow few steps discussed in this article to calm down your kid. My son aged 9 yrs name Manan Nankani is very hyper he having everything OK but due to hyper one person is with him . we can’t leave him alone if we go somewhere. If you have any suggestions please let us know.